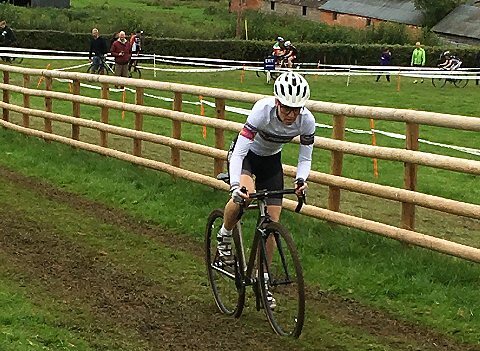 Harriet and Ross Harnden took the women’s and senior men’s event respectively in the fifth round of the Ridley Lazer West Midlands Cyclo-Cross League at Shelsey Walsh in Worcestershire. The Malvern based siblings used their mountain bike backgrounds to their advantage on the gruelling course which snaked up and down the countryside. 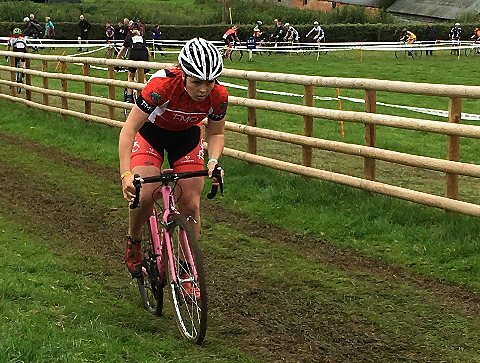 Shelsey Walsh is notorious as the world’s oldest motorsport venue dating back to 1905 but once a year the venue is opened up for a cycling hill climb and cyclo-cross event joint organised by Worcester St John and Wyre Forest CC. 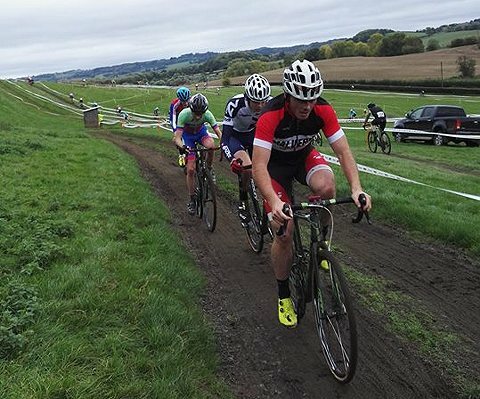 Ross Harnden, who rides for Malvern Cycle Sport, started near the back of the gridding but soon joined Marcus Holmes (Lichfield City CC), Cameron Biddle (Rivet Racing) and the Knight brothers Jacob and Harrison. Mid-way through the race the Solihull CC brothers were dispatched from the leading group leaving the leading trio to battle out the final lap. Holmes bunny hopped the hurdles early on the final lap to gain a small advantage but Harnden clawed his way back to the junior before launching his winning attack on the final climb. “I tried a few attacks but the others weren’t so weak that I could get a gap so I knew it was going to be fairly close and I just had to wait for an opportunity on the last couple of laps,” said Harnden. Darren Atkins (Ride Coventry) again dominated the veteran’s over 40 category riding through the senior field to 10th overall despite starting almost two minutes behind. He was again chased by Philip Glaze (Stourbridge CC) in second while Gareth Scott (Bicicielo) edged Colin Miller (Ride Coventry) for third place after Miller had drawn him back during the race. The women’s race saw 16-year-old European Mountain Bike Champion Harriet Harnden (T Mo Racing) take an emphatic victory by over two minutes. The youngster took the lead after the opening climb and built it throughout the race into an unassailable margin. Behind the battle for second saw veteran Isla Rowntree (Isla Bikes) battle it out with Ceris Styler (Halesowen A&CC). Styler had an early lead but the experience of Rowntree shone through and clawed back the younger rider before taking second. Second woman veteran was Karen Summers (unattached) while Amanda Whitehouse (Stourbridge CC) finished third in category. In the veteran over-50 category Stephen Knight (Team Jewson MI-Racing) made it five from five with another display clear victory, finishing over three minutes clear of his closest rival. He beat his team-mate Mark James in second ahead of Stephen Whitehouse (Stourbridge CC). The youth race was another close affair but ultimately Simon Wyllie (Halesowen A&CC) took his fourth victory of the series. He was pushed all the way by Emile Alexander (Lichfield City CC) but forced a narrow gap in the closing stages to win by two seconds while Taylor Carr (Lichfield City CC) took a clear third. Alex Barker (Halesowen A&CC) took an emphatic victory in the under-14 category ahead of Sullivan Berry (Redditch Road & Path CC) in second Joseph Brookes (Halesowen A&CC) third. Lucy Hart (Mid Shropshire Whls) put in another phenomenal ride in the under-16 girls for her fourth win of the series. Despite starting over two-and-a-half minutes behind the under-16 boys Hart road through the field into 12th overall. She beat Kinga Ingram (Halesowen A&CC) into second while Grace Lister (Wolverhampton Whls) was first under-14 in third. Spencer Corder (Stratford CC) made it five wins from five in the under-12 race while Tia Carr (Lichfield City CC) achieved the same in the girl’s event. The under-10s event was won by Daniel Ward (Mercia CC-Lloyds Cycles) while Aelwen Davies (The Bulls) won the girl’s category. Jude White took another victory for Mid Shropshire Whls in the under-eights event and Rose Neely (Solihull CC) was the girl’s winner. Finally, Millie Barton (Mid Shropshire Whls) added a further victory for her club in the under-six girls and also beating all the boys in the process with Sam Styler (Halesowen A&CC) finishing second and first boy.